In order to facilitate your investigation, you'll need to become familiar with the various types of military records in existence (such as muster rolls, bounty-land warrants, pensions, etc.) and the information they contain. It is equally important to understand what resources exist on the county, state, and federal levels, and where such documents can be found. For veterans' service records, the National Archives has created a comprehensive resource for more information about how to request the records you seek. The Historical Society of Pennsylvania has a major collection of military unit histories, bibliographies, indexes, memoirs, and related publications. Our collections document wars from the colonial period through World War II. The following is a small sampling of resources available at HSP, including personal papers of soldiers; papers from families affected by war; accounts kept by commanders, medical personnel, and provisioners; and published resources. Please refer to our online catalog for more information about the books, images, journals, manuscripts, maps, and other items in HSP's collection. You can also contact a Reference Librarian for further assistance. Material related to the French and Indian War can be found in the Conrad Weiser papers, Shippen family papers, Braddock Fort Duquesne expedition papers, John Van Etten journal, and various pamphlets regarding the Paxton Boys (or Paxton Volunteers). HSP's collection includes the papers of Revolutionary military officers such as Anthony Wayne, William Irvine (in the Irvine-Newbold family papers, #1890), Edward Hand, John Cadwalader, Daniel Cunyngham Clymer, Ann Louis de Tousard, and Baron Marie Francois Joseph Marine Cromot Du Bourg. The diary of Aaron Norcross gives a foot soldier’s perspective on the war. The Jonathan Potts papers and Lewis Beebe journal detail army medical supplies and practices. The John Ross records, Chaloner and White records, and Pennsylvania Salt Works waste book and ledger concern the provisioning of troops. Civilian accounts of the war include the papers of Philadelphia druggist Christopher Marshall and of Pennsylvania Quakers Sarah Logan Fisher and various Pemberton family members. HSP also has orderly books from a number of Revolutionary War regiments and commanders. Try searching in HSP's online catalog for "orderly book," and filter the results by era (in the right column). These conflicts are represented in the papers of officers William Neill Irvine (in the Irvine-Newbold family papers, #1890), George Birch, Robert Carr and British Navy sailor William Begg. The papers of Commodore John Rodgers and shipbuilder Joshua Humphreys document the growth and operations of the U.S. Navy in the early 19th century. Administration of the Army in this period is detailed in the papers of Daniel Parker (Adjutant and Inspector General, 1810-1845) and Joel Roberts Poinsett (Secretary of War, 1837-1841). For details on the Society’s extensive collection of Civil War materials, both published and unpublished, see the guides to Civil War Resources, Civil War Manuscripts, and Women During the Civil War. Among the more notable collections are the papers of Union generals George Gordon Meade, A. A. Humphreys, and John White Geary; Captain Edward A. Acton; Charles Winthrop Lowell (a white major in a black regiment); the diaries of U.S. Navy sailor Charles R. Mervine and soldier James H. Walker; and Robert Knox Sneden’s drawings of Confederate prisons. Civilian support for soldiers is documented in the records of the Philadelphia Branch of the United States Sanitary Commission, papers related to the Union Volunteer Refreshment Saloon, and the diary of Susan Ritter Trautwine MacManus, a Moravian evangelical who visited Union soldiers in Philadelphia hospitals. HSP also holds a large number of published resources related to the Civil War. Try searching in our online catalog for subject terms like "Civil War," "Union," "Confederate," "Confederacy," and other related terms. You can also contact a Reference Librarian for further assistance. The Knepper brothers letters discuss U.S. naval operations during the Spanish-American War and the U.S. conquest of the Philippines that followed. The diary of Alfred H. Whitaker includes detailed information about his military service in San Francisco and the Philippines in 1898 and 1899, including a handful of photographs. Various published holdings can be found in HSP's online catalog by searching for terms like "Spanish-American War" and "Philippines." Military life is documented in the papers of Army officer Ward W. Pierson, aviator Stephen H. Noyes, surgeon William J. Taylor Jr., machine gun instructor Isidore Baylson, YMCA volunteer George V. Z. Long, and band member Stanley Woodburn. Records of the United States Selective Service System in Philadelphia document the work of local draft boards. Edith Gillingham’s diary (in the Harold Edgar Gillingham collection, #1730A) and Sarah Hallowell’s letters (in the Perot family papers, #1886) describe wartime civilian life in France. The records of the National League for Woman’s Service and the Pennsylvania Railroad Women’s Division of War Relief, and images from the Philadelphia War Photograph Committee document a range of home front activities. Wartime imagery and propaganda is gathered in HSP's collection of World War I posters, general war posters collection, Liberty Loan posters, and War Welfare Council of Philadelphia and Vicinity War Chest Drive records. An assortment of published holdings can be found in HSP's online catalog. Life in the military is documented through letters in the Edith Lincoln Leonard collection, Frank Gordon Bailey World War II correspondence, H. M. Plowman diaries and journals, and infantry medic Keith Winston’s manuscript, “A Soldier Called Keith.” The HSP collection of World War II papers documents the debate between pro- and anti-war groups that preceded the United States’ entry into the war. The collection also includes records of the United Service Organization of Philadelphia, which offered recreation and assistance to members of the armed forces and their families. Several collections record the work of other civilian relief and service groups, including the Philadelphia chapter of American Relief for Poland, United Seamen’s Service (in the John F. Lewis papers), the Yam Tong Hoh and Daisy Law Hoh papers, and the Mrs. Stacy B. Lloyd papers on the American Red Cross’s Allied Prisoners of War Food Packing Service. Wartime photos can be found in the Philadelphia Record photograph morgue and the World War II photograph collection. Other images can be found in the World War II propaganda collection and in the HSP war posters collection. The persecution and mass imprisonment of Japanese Americans during World War II is documented in the papers of Shigezo and Sonoko Iwata, Saburo and Michiyo Inouye, Marion Potts, Sumiko Kobayashi, Dean Yabuki, and several other manuscript collections, as well as in microfilm copies of numerous internment camp newspapers and papers of the United States Commission on Wartime Relocation and Internment of Civilians. HSP's published holdings can be found in our online catalog. The David Library of the American Revolution focuses on the study of American history from approximately 1750 to 1800. The Grand Army of the Republic (GAR) Museum & Library focuses on the Civil War. 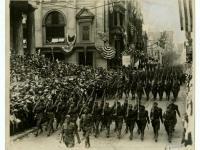 The National Archives at Philadelphia offers access to a variety of military-related records from federal agencies, including original archival materials. The Sir John Templeton Heritage Center of the Union League includes the collections of the Abraham Lincoln Foundation, which is currently the steward of the Military Order of the Loyal Legion of the United States and Dames of the Loyal Legion of the United States archives, and The Civil War Museum of Philadelphia, which are currently being catalogued at the Historical Society of Pennsylvania. In 2013, they will be brought to Sir John Templeton Heritage Center after the completion of the high density collection storage. The U.S. Army Military History Institute has an extensive military history library, and its collection relates to the history of not only the U.S. Army, but also the Navy, Air Force, Marine Corps, reserve components, and foreign militaries.